Hello, I also have a 1967 GTA S Code 390. The car has the exterior decor group, interior decor group. Wood grain steering wheel. Ceiling console, AM/FM Radio, Tach and seat belt reminder light. My husband worked for Ford Motor Company and brought this car home one da. It was beautiful. Wish we could have kept it. Lol. I think the 1967 ford mustang is the coolest car in the state of Texas . I love the color green . Your friend Denver Yates . The red button is actually a parking brake light. I have the exact same car but with a 302 4v and Tach package. GT package has been added post production. 1 of 256 built. Here is another link to the book which can be purchased directly from the publisher. or a preview of some photos in the book which are also on this site. 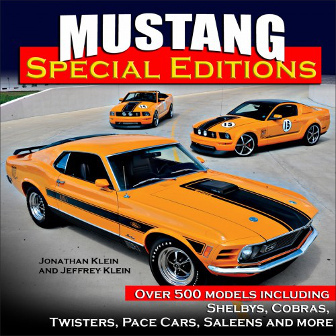 With your help over the past 10+ years, we have been writing a book about special edition Mustangs. The book is available now. It's packed with 662 special models by year grouped into 215 categories. Click here to order a copy of our Book today. We have created a printable index of all the special models in the book. Take a look. There are 2X more special models in this book than are on our site. The hardcover book is 192 pages long, 10x10 inches in size, has over 96,000 words, and contains 457 color and 52 black-and-white photos. Chapter 7: Dealers, Tuners & Third Party Special Editions - everyone gets into the game, Shelby, Saleen, Roush, Steeda, etc. It is not over. There are many more special and limited edition Mustangs out there which are yet to be discovered. We are collecting these for a second edition, to be out in a few years. Do you have photos or more information? Let us know. 2018 Mustang - Even More Awesome! Information on the new 2018 Mustang with more performance, new paint colors, and new design features inside and out. Information on the 2017 Mustang including the Shelby GT350 and GT350R. Adding the special models of the 2016 Mustang, we now have compiled a list of 300 Special and Limited Edition Mustangs by year. You can see all 300 at the bottom of our home page or on our sister site SpecialMustang.com. These 300 can be grouped into 87 general categories of Special Model Mustangs from the Mustang GT and Shelby through the Special Anniversary Editions, to the local "Territorial" Special Promotional Mustangs. Check them out. Today we also release a new feature of our site. It's a QR code card which you can display on your Mustang during car shows. 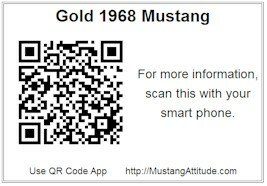 It will allow show visitors to get more information about your Mustang by scanning the code with their smart phone. Now you know why we released a mobile version of our site. Click here for more details on the QR code card. Do want a set of cards for your Mustang that is already on our site? Email us with a link to your car and your mailing address. We will send you a couple of QR code cards right away. Or, you can print out your own by clicking on the QR code image under your photo on the non-mobile site. We can finally show you MustangAttitude Mobile. This is a new version of the site optimized for the smaller screens of smart phones. You can view all the Mustang photos, explore styles/paint/engine options, and even submit photos of your Mustang taken with your phone. Do you have a special order 1967 Mustang hardtop in an unusual exterior color from Nebraska? We are looking for examples of this limited edition Mustang which was created to commemorate the 100th anniversary of Nebraska's statehood. From the advertisements we've found, the Centennial Special Hardtop came with the Sport Sprint option and one of four "Special Centennial colors": Centennial Blue, Lincoln Green, Summer Wheat, and Big Red. See the advertisements for more information. Check out this video from Reiny van Uden from Volkel The Netherlands. Also see photos of Reiny's ROC Mustang on our site. Yep a Wimbledon White 50th Anniversary Limited Edition Mustang! Yep, we were correct over 5 months ago; the 50th Anniversary Limited Edition Mustang will be in an exclusive Wimbledon White exterior paint similar to the first white offered in 1964 on a Mustang. The other exclusive color is Kona Blue which was last offered on a Mustang in 2012. 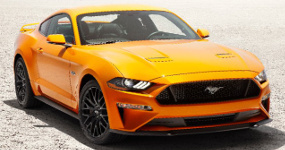 It will be a Mustang GT coupe with performance pack, 50th Anniversary badges, extra exterior chrome, upgraded interior, and cool layered glass rear-quarter "louvered" windows. Wimbledon White 50th Anniversary Limited Edition Mustang? Gonzo is a new owner of a Rainbow of Colors 1968 Mustang which was originally part of the promotion in Hawaii. Check out his car. 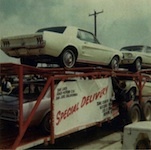 Check out these vintage photos sent to us by Gary, whose wife used to own one of these unusual Chicagoland Limited Edition 400 Mustangs from 1967. We also found some local newspaper advertisements for this special Mustang. Craig and Denise MacGregor of Australia just recently bought a 1967 Mustang convertible for a Shelby project, but after requesting a Marti report, the car turns out to be one of the special ordered, Denver area, She Country Special Mustangs. See the story and photos so far. Below are a few of the many car shows that we and or our viewer are attending in 2012. Let us know of others. Saturday June 23, 2012: Princeville Illinois at Steven's Square Park. Click here for photos we took. Saturday/Sunday July 21-22, 2012: Bellevue Washington at Bellevue College. Saturday, around 1000 Mustangs are expected to show up! more info. Did you know that there are at least 278 types of Special or Limited Edition Mustangs offered over the years in 78 general categories from the Mustang GT, to Anniversary Editions, and including significant Ford and dealer promoted local promotions? Check out our homepage for a list of them all. Do you own one, or are we missing yours from our list? Consider submitting photos and information to share. Get into a Mustang state of mind with a 1985 Ford Mustang commercial. Check out our growing collection of over 500 photos of Mustangs from outside the United States. Help us grow this collection. Consider submitting photos of your Mustang. Do you have a Mustang in the US or Canada? Check out our collection of Mustang photos by state. Information on the 2013 Mustang is out. New front, hood and rear; new colors; new instrument gauges; and quite a few other new items. Check out what we've compiled so far. Special thanks to Mustang owners; Roman from California, Mark Wieszyk from South Australia, Jeffrey Wheeler from Oregon, Jim Srp from Texas, Stephen with the 70 Boss, Gord Gow from Canada, Izzy Cobovic from New York, Mike Barrett from Colorado, Gary Horn from Utah, Julie Klein from Illinois, John Klein from Washington, and Pete & Cheri Dahlgren from Washington. Looking through local newspapers in the US and Canada between 1964 to 1970 has allowed us to put together a different type of history of the Mustang. It is a history of the Mustang through the eye's of the newspaper with a focus on Mustang advertisements. This is an interesting view of the Mustang throughout the years because we can see what was important each year through photos, graphics, models, written text, phrases, etc. Most unexpectedly it also shows an interesting view of why styles changed and how special promotions created special and limited edition Mustangs. Ever hear about the 1969 Mustang 4.1 Liter Special? We found some data possibly confirmed by a viewer that owns one. We think they were all were delivered to the Indianapolis order district (DSO 46) with special order numbers 0572, 0573, and 0574. The owner says this special order Mustang came with an automatic L-code 4.1 liter (250ci) 6-cylinder engine; special order exterior green WT7034, yellow or orange paint; white and gold pinstripe; and a 4.1 Litre Special checkered flag fender badge. Let us know if you have more information. A viewer just sent us photos and newspaper advertisements from 1965 and 1966 for the Blue and White Mustang Player's special edition hardtop. These Mustangs were painted blue and white to match the Player's cigarette package. All models were hardtops, had this special blue and white exterior paint, 200ci 6-cylinder engine, full wheel covers, and an AM radio. The promotion was run as Mustang-A-Week contests in many Providences in Canada between 1965 and 1968. See some of the Players Special Edition Mustang winners we've found. We found many newspaper advertisements for the newly discovered 1967 Mustang Blazer Limited Edition Mustang which featured Lime Gold exterior paint, black vinyl top, personalized interior nameplate, and Blazer exterior nameplate. This was a local limited edition Mustang for the Ohio, Pennsylvania, West Virginia, and Maryland area from mid November to mid December of 1966. We think the Blazer exterior nameplate was placed just below the Mustang lettering just behind the front wheels as shown in this image we modified. Take a look at the newspaper advertisements and let us know if you have any more information. We think we just found a new limited edition Mustang! Its called the Dixie Special Mustang which was available only the Mississippi and Louisiana area in the spring of 1968, and featured special paint, a Dixie Special license plate, and a Dixie Special emblem. Take a look for yourself at the newspaper advertisements we found. We also think someone found one! Did you know that one of the 1974 Mustang sales brochures included a paper car cutout of the Mach 1? Sam Atwal, one of our visitors, created a paper car for the 2011 Mustang. The 2011 MustangAttitude.com Calendar is Here! Special thanks to Mustang owners Richard Peoples from Florida; Teri Garcia from Pennsylvania; Lajos RecskÃ³ from Hungary; Bobby Aldrich from California; Dana Bowers from Florida; Dave Martin from Maryland; Phil Phillips from Oklahoma; Peter J. Slaney from Massachusetts; Dwight Koslowski from Michigan; Dale Smith from Australia; S Raleigh from Utah; and HÃ¥kan Palm from Sweden. Other more commonly known Territorial Specials included the 1968 California area California Special, 1966-68 Denver area High Country Special, 1967 Denver Ski Country Special, 1968 Seattle Golden Nugget Special, 1967 Texas Lone Star Limited, 1968 North Carolina and Virgina Cardinal Special, 1969 Philadelphia Limited Edition 600, 1970 Nebraska-Iowa Sidewinder, and 1970 Kansas City Twister Special. just opened and you can pick up all sorts of Ford and Mustang official gear and upgrades. Below are a few of the many Mustang car shows that we and or our viewers attended in 2010. 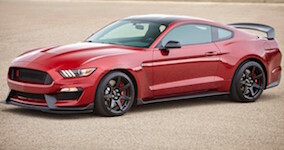 The California Special, Boss 302R, Mustang Club of America Special Edition, and Shelby GT-350 Limited Edition are just some of the new special models announced for 2011. Check them all out here. Also explore all the 2011 Mustang data we've been able to gather to date. We have put together a 2010 Mustang Calendar containing a collection of 12 awesome Mustang photos submitted to us from site viewers. This colorful calendar measures a massive 17 inches wide by 22 inches tall when opened up and hung on a wall. Want to see more Mustangs? Check out our thumbnail list of all Mustangs on eBay right now! 1964: New Ford Mustang ... a totally new king of total performance Ford! 1967: Bred First... to be first! 1969: ...your first Mustang made life more delicious, right? So how about a second helping? 1971: '71 Mustang... It's a personal thing. 1978: ...takes you away from an ordinary day! 1982: Mustang covers you from simmer to sizzle! 1983: The Difference Between Just Getting There... and Really Arriving. 1984: The experts have spoken. Now there's only one thing left to say. Mustang SVO. 1994: The all new Mustang. It is what it was. 1995: ...there's nothing else on the road quite like a Mustang. 1996: Mustang. There's nothing else like it under the sun. 1997: Choose your level of performance: Exciting. Or downright exhilarating. 1998: It's your time. It's your choice. It's your chance. 1999: Reinterpreting an American icon is a daunting task. 2000: When was the last time you headed nowhere in particular? 2000: La liberte signee Mustang. 2003: Thinking of owning the road? Time to "Pony Up." 2004: Fortunately, Smokin' hasn't been banned everywhere. 2009: Top Down. Decibels Up. The Thumping. 2010: When was the first time? 2015: Your wildest dreams. Just got real. 2016: Put your foot down. And let the adrenaline flow. 2017: This is a love-at-first-sight, want-you-so-bad, feels-so-good king of car. 2019: Get Yours. Get gone. And leave everything else behind. What is the difference between a Ford M, WT, or MX code paint? How about a list of all of them with color samples, color names, Ditzler PPG codes, Dupont codes, and links to photos of actual cars if they are in our photo database. Did Ford ever use a GM paint on a Mustang? These questions and more can be answered with our Paint Color Code Cross-Reference Database. We've also added other Manufacturers cars, trucks, and heavy equipment. This database is being set up to understand the historical usage of colors on special order Mustangs including the 1968-69 Rainbow of Colors, 1968 Color of the Month promotions, as well as understanding special usage in all Mustang colors. Did you know that in 1967 you could order a Mustang in one of over 40 colors? Or that in 1968 over 26 special order paints were offered free as part of promotional packages? Or that there are hundreds of special order paints available from Ford every year? We also have many of the GM special order WE-code paints as well as the Chrysler special order DT-code paints. Did you know that there are about 2000 Mustangs for sale on eBay right now? And this is out of a total of nearly 50,000 cars on eBay every day. How do you find the best deals on that unique Mustang when what's for sale changes on a daily basis? Also checkout the Mustangs For Sale on MustangAttitude.com. If you have one for sale, consider submitting photos and information here. Thanks to Mal Hillier of Melbourne, Australia, for the information on his Black Hills Gold, 1968, January, Color of the Month promotional Mustang. We've added his car to the February Passionate Pink Mustang and April Eastertime Coral Mustang. We are still looking for a March Emerald Green Mustang, but we have recently discovered that Emerald Green was a Ford Special Order Fleet Paint until at least 1988. If you have any information on this promotion, please contact us. Update: 1968 Color of the Month promotional Black Hills Gold shares the same paint codes with 1968 Rainbow of Colors promotional Spanish Gold. The date and assembly codes on Mal's 1968 Mustang hardtop more closely matches the 1968 Rainbow of Colors promotion, although it is a great example of what the January Color of the Month gold looked like. Red, White, and Blue are the three basic paint colors offered on each year of Mustang production (1964-2010). Thanks to Chet (owner of a 1993 Mustang GT) who emailed us with the correct answer first. He will receive a MustangAttitude.com window decal set. Do you like quizzes? Check out our new on-line Mustang Trivia Quiz. Warning: It's not an easy quiz. Thanks goes to Peter Manson: owner and restorer of a 1969 Poppy Green, Rainbow of Colors, Mach 1 Mustang; for his information on this promotion. Thanks to all our viewers, we have been compiling more color information on the 1968-69 Rainbow of Colors west coast Mustang promotion. 13 colors were offered with wild names such as Whipped Cream, Spanish Gold, Dandelion Yellow, Hot Pink, Caribbean Coral, Forest Green, Sierra Blue, and Moss Green. And much more information is out there... If you have a Rainbow of Colors Mustang, please consider submitting photos to us. Or if you have additional information, please let us know. Thanks! We are starting to compile information on the 2010 Shelby GT-500. The front and rear fascias have been redesigned above and beyond the 2010 new Mustang V6 and GT fascias. The Cobra emblem has a new design and is placed on the other side of the more narrow upper front grille. The lower grille is larger. The side lower body stripe has a new look. New wheels, and for the first time the GT500 coupe will have different wheels than the GT500 convertible. The engine will have 540hp with the addition of the Ford Racing Power Pack, Shelby tuning, and improved Tremec Twin-disc clutch 6-speed manual transmission. And the interior has been redesigned. Exterior color offerings are Grabber Blue, Kona Blue, Torch Red, Performance White, Sterling Grey, Brilliant Silver, and Black. We are starting to compile information on the 2010 Mustang now that some of the preliminary data is out. Yes, the front and rear end has been redesigned; and yes, there are more electronic and eco-friendly features. But some of the unexpected excitement comes from a redesigned dash and instrument gauges, new exterior colors including Grabber Blue, a variety of interior colors, standard Ambient Lighting on all cars and with more locations of light, sequential taillights, and all new wheels including some 19 inch versions. We have put together a collection of 12 incredible Mustang car photos submitted to us from viewers covering many of the last 46 production years of the Mustang. This colorful calendar measures 17 by 22 inches when hung on a wall. Jon Jackson from Illinois; Allan & Nancy Eisentraut from Hot Springs Village Arkansas; Todd Weddle from Max Meadows Virginia; Raynald Bï¿½langer from Boucherville Quebec Canada; Rex Turner from Vienna Virginia; Don Klatt from Oregon, Ohio; David Hammer from Oklahoma; John Klein from Redmond Washington; Eddie from Canada; Johnny R Walker from Forrest Illinois; Julie Klein from Illinois; and Arlie Moses from Humble Texas. How many shades of Yellow Mustangs have been offered in the last 46 production years of the Mustang? What are all the special Mustang models that only came in green? What years of Mustangs offered Grabber colors? How about examples of all 679 colors ever offered on a Mustang? We've just compiled a special color index to all the Mustang photos in our database. These pages show all special colors, special models, and all color offerings of each production year with examples and links to high resolution photos. Come back often as we add more photos to our database and more color information. What exactly does Aspen Red look like? Frank Recupero of Okhurst, California, submitted his rare 1967 Ski Country Special; but is it Aspen Red? MustangAttitude did a little research and found the Dupont paint chip for Ford MX 707587 (DuPont 2721H 93-83001H)). It was used on the 1958 Ford Edsel (but called Ember Red) as well as a custom color for vintage Gibson guitars, but the color appears to match! This is not ready for prime-time but, do you want to see every Mustang model, color, and engine for the last 45 years? Check this out, but get ready to download a lot of information. This page was compiled with thumbnails selected from the thousands of photos on our site. Click on any of the text below the photos to see all the cars of this type that we have compiled. Are we missing your color? or your special model? Submit your photos here. We need your help in creating our 2009 MustangAttitude.com official calendar. There will be 12 featured cars, so submit photos of your Mustang now. We have a winner. The first image posted to this site was a Legend Lime 2005 Mustang GT posted on 7/22/07. Johnny Walker, the owner of our July 20th, 2008's Attitude Of The Week, correctly identified it. For his detective abilities, he will receive a MustangAttitude.com window decal. This week marks the first year Anniversary of the MustangAttitude website. It's been a busy first year: collecting photos from site visitors; gathering data for each Mustang model year in our Mustang Data Explorer; then linking the models, colors, and engines to the 6000+ photos on the site. We are running a quick Contest - Who ever emails the webmaster first with the description or link to the first Mustang photo set posted on this site will receive a "MustangAttitude.com" window decal for their Mustang. Act quickly, it will not take long to get a winner. Hint: there is a post date displayed in the text below the picture when you click on a thumbnail. What's the most popular Mustang photo on this site? How about the most popular year? Or the most popular color? 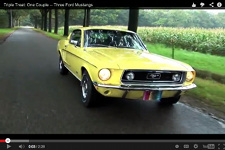 Click here to see the most recent top ten Mustang years, cars, and colors being viewed right now. The 2009 Mustangs are out! Several new 2009 Mustang photos have been posted. Some interesting information on the 1968 Easter Color of the Month promotion. These are examples of a little known 1968 Easter Collection of Colors dealer promotion. Getting ready for the 2008 SEMA show in Las Vegas? We have some Mustang photos from the 2007 SEMA show. We have several Mustangs posted for sale. If you have a Mustang for sale, submit your photos here. We can mark it For Sale and direct interested people to your email or phone number. The For Sale signs will be on your photos for 3 months. You can email us to remove the For Sale sign or extend it another 3 months. We do ask that we keep your photos on the site after it has sold to enhance our huge database of Mustangs. Check out this Boss 429. Steve bought it from his cousin after selling his 1968 Torino 390 Convertible and 1969 Fairlane Cobra. Check out these three 1982 Mustang GT hatchbacks in all in black and all in a row. Nice! This is a custom 1965 Mustang hardtop is all bright in its Yellow exterior paint with black stripes, hood cowl, and custom wheels.